As domestic violence allegations have surfaced more frequently in custody-litigating families, child custody evaluation has become increasingly challenging, and competing paradigms and research claims have contributed to gender bias in the process. Prevailing biases seem based on flawed assumptions, and women’s claims to domestic and sexual violence are viewed with suspicion, so much so that they are even getting legal advice not to disclose domestic violence because it will be used to damage their credibility by opposing parties and to support conclusions that find against her. 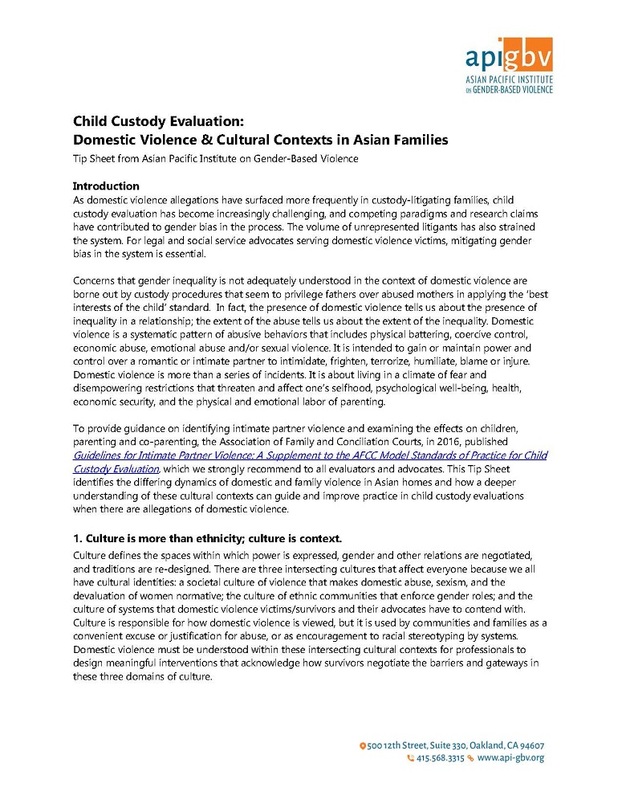 This Tip Sheet identifies the differing dynamics of domestic and family violence in Asian homes and how a deeper understanding of these cultural contexts can guide and improve practice in child custody evaluations when there are allegations of domestic violence. Culture does not reveal stable patterns, but dynamic ones where experiences and commonalities continually re-shape it.